Tickets: $60 VIP seating is limited, $20 tickets. Day of show tickets $25. 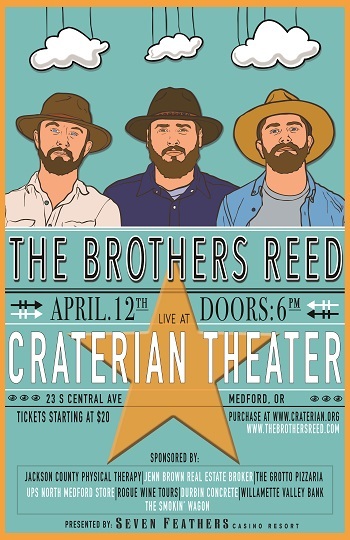 Join Southern Oregon based folk troubadours, The Brothers Reed, in commemorating the release of their fourth studio album, “Caught in a Dream”. This special show acts as The Brothers personal thank you to the wonderful friends and family of the State of Jefferson, whom have unflinchingly supported the band since their inception in 2014. The brothers will perform the new album in it’s entirety; joined by T.J. Eilers (standup bass), Nancy Martin (Cello) and Matthew Kriemelmann (Drums). The show will also feature guest openers: Northern California based group, Windfields as well as Portland based solo artist Redwood Son. VIP tickets are limited and will include access to the forum from 6:00PM- 7:15PM where there will be complementary food and beverages. It will also include a package of merchandise signed by the band. Please call the box office to reserve these tickets.